Our company offer a multimedia platform designed with combination of IPTP Networks’ in-house developed software and a free, open source software platform with a 10-foot user interface (Linux). 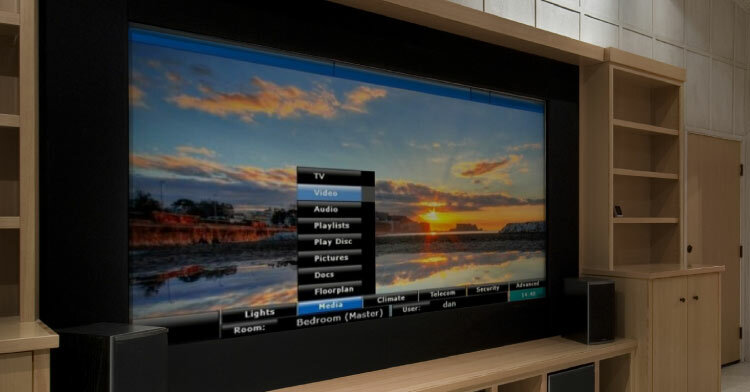 Its designed to allow a computer or mobile device to act as a home theatre PC (HTPC) for the living-room TV, personal video recorder, and home automation system. It allows control of everything in the home, from lighting and climate to surveillance cameras and home security. The television subsystem allows ordinary television, as well as a selection of additional elements that transform it into a multi-media system. Among these elements are: access to a library of movies, music, karaoke, video clips, an option of recording TV programmes for later viewing, importing blue-rays into the library and much more. You have complete control of the premises directly from the TV via an on-screen menu. Video-phone mode and volume control from every corner of the premises are also available. For more information see sections: IP TV and Video on demand.